Saccharides are better known as carbohydrates (literally hydrates of carbon). Relatively complex carboyhydrates are known as polysaccharides.The simplest carbohydrates are monosaccharides, which are small straight-chain aldehydes and ketones with many hydroxyl groups added, usually one on each carbon except the functional group. Examples of monosaccharides include glucose (dextrose), fructose (levulose) and galactose. Monosaccharides are the building blocks of disaccharides (such as sucrose and lactose) and polysaccharides (such as cellulose and starch). A disaccharide is formed when two monosaccharides (simple sugars) undergo a condensation reaction which involves the elimination of a small molecule, such as water, from the functional groups only. Like monosaccharides, disaccharides are soluble in water. Three common monosaccharides are sucrose, lactose and maltose. "Disaccharide" is one of the four chemical groupings of carbohydrates (monosaccharide, disaccharide, oligosaccharide, and polysaccharide). An oligosaccharide is a saccharide polymer containing a small number (typically three to nine of simple sugars (monosaccharides). Oligosaccharides can have many functions; for example, they are commonly found on the plasma membrane of animal cells where they can play a role in cell-to-cell recognition. Polysaccharides are polymeric carbohydrate structures, formed of repeating units either mono- saccharides( e.g., glucose , fructose , galactose) or di-saccharides ( e.g., sucrose, lactose) joined together by glycosidic bonds. They range in structure from linear to highly branched. Examples include storage polysaccharides such as starch and glycogen, and structural polysaccharides such as cellulose and chitin. Polysaccharides contain more than ten monosaccharide units. Definitions of how large a carbohydrate must be to fall into the categories polysaccharides or oligosaccharides vary according to personal opinion. Amylose is a linear polymer of glucose mainly linked with alpha (1→4) bonds (see above). It can be made of several thousands of glucose units. It is one of the two components of starch, the other being amylopectin. Amylopectin is a branched polymer of the glucose molecule (see below). Polysaccharides have a general formula of Cx(H2O)y where x is usually a large number between 200 and 2500. Considering that the repeating units in the polymer backbone are often six-carbon monosaccharides, the general formula can also be represented as (C6H10O5)n where 40≤n≤3000. Cellulose is an example of a structural polysaccharide. It is used in the cell walls of plants and other organisms, and is said to be the most abundant organic molecule on earth. Cellulose is formed when beta-glucose molecules are joined to form a polymer similar to how amylose is formed as a polymer from alpha glucose. Humans, unlike cows don't have the necessary bacteria in their intestines that make the enzymes(cellulases) which can breakdown the 1-4 beta glucose bonds. So we cannot break down cellulose into its constituent glucose molecules as we do with starch. Even though these complex carbohydrates are not digestible, they provide important dietary elements for humans -- called dietary fiber. Dietary fibers enhance digestion among other benefits. The main action of dietary fiber is to change the nature of the contents of the gastrointestinal tract, and to change how other nutrients and chemicals are absorbed. Soluble fiber binds to bile acids in the small intestine, making them less likely to enter the body; this in turn lowers cholesterol levels in the blood. Soluble fiber also attenuates the absorption of sugar, reduces sugar response after eating, normalizes blood lipid levels and, once fermented in the colon, produces short-chain fatty acids as byproducts. See more about the difference between alpha and beta -D- glucose molecules. Note: Cellulose does not branch -- it is a straight chain polymer. Furthermore, due to the hydrogen bonds between molecules it can form very rigid fibers. WHY IS CELLULOSE RIGID BUT AMYLOSE IS NOT RIGID? 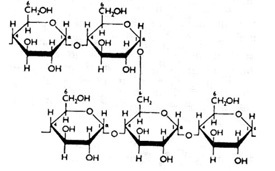 In cellulose, glucose units are bonded together by β(1→4) glycosidic bonds. Because of the beta linkage in cellulose, there is some intramolecular hydrogen bonding that seems to keep adjacent glucose units aligned along the same line. Cellulose doesn’t branch, and it is a straight chain polymer. However, due to the hydrogen bonds between molecules it can form very rigid fibers (see 3d structure of cellulose). Since each cellulose molecule is flat, they can stack on top of one another. When they stack In the cell walls of plants cellulose they forms fibrils. What is the difference between saturated and unsaturate fats?